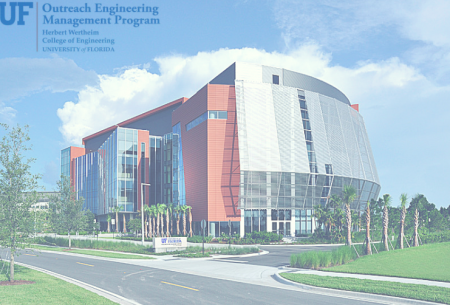 Our Outreach Engineering Management (OEM) Master’s Program will be hosting a networking reception and info session at our Orlando classroom facility in Lake Nona’s Medical City on Wednesday, May 17, 2017. We invite anyone who is interested in learning more about OEM to join us for a presentation and a chance to speak with current OEM students and alumni at the reception. An online information session, will also be held on Thursday, May 4, 2017. OEM is a part-time Engineering Management master’s degree program designed for full-time working professionals, with classes convening only one weekend per month for 20 months. The next cohort begins classes in August with meetings in Orlando. Students earn an MS degree in Industrial & Systems Engineering (Engineering Management track) after taking 5 graduate engineering courses as well as 5 graduate business courses that comprise a typical MBA core. For many students, this blended curriculum is a solution to the problem of whether to get a technical master’s degree or an MBA, and a concurrent OEM/MBA degree option is available for students who want both degrees. Along with providing a strong foundation in business, the OEM curriculum covers advanced mathematical techniques for making informed decisions, refining service and manufacturing processes, and managing risk. These skills are applicable to many industries and functional roles, and students from a wide variety of academic backgrounds participate in the program each year. The next application deadline is June 6, 2017. For more details, or to subscribe to the OEM email distribution list, please visit the OEM website, which includes complete application materials. Contact: oemprogram@ise.ufl.edu or 352.392.0928.